One of the great surprises upon landing in Japan was the fact that public drinking (within reason, of course) is completely legal. I've seen women in kimonos sipping a cold beer on the train, and salarymen walking in a group down the street each holding some form of grown-up pop. There are, I'm sure, arguments for and against allowing such a thing, but here it seems to work. There are strict rules about drinking and driving as well as drinking and bicycling, which helps maintain a sort of balance. But this post isn't about Japan's alcohol consumption habits. Well, not directly, anyway. The other thing we discovered as a result is the sake cup. Since public consumption isn't illegal and because sake is so popular, one can purchase individual servings in either "drink box" form (complete with straw) or in the small glass container pictured here. The sake inside isn't of the highest quality, but it's still smoother than any I ever drank in America. And it seems, in the spirit of mottainai, the cups can be reused later as vases. Usually I've seen full cups left as offerings in cemeteries and there is where I first saw one used as vase. 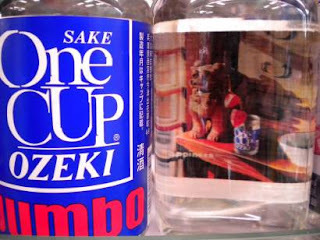 I thought it quite logical and therefore not necessarily extraordinary, but the sake cup company apparently did. As shown in the photograph above the back of the label shows a photo of assorted cups transformed to vases. Sometimes at a bus stop, sometimes just on a wall, or in this case next to a cute little dragon, each holds a single flower and looks like such a happy thing. Mottainai, indeed. But who has enough time to pick that many flowers!?!? Where can I even find enough flowers to fill all the vases I have accumulated? Those glass cups were so useful! Once while vacationing we were going to open a bottle of wine, but discovered that we didn't have cups in our room, so we just popped into the nearest conbini for a couple of sake cups. Kevin, You may have a larger issue there....:) Maybe use some to make small batches of umeshu or yuzushu? Linsay-Jean, Isn't that brilliant?? We've done the same thing, and we also find they make great gifts to bring home to friends in America, too. When were you here? Summer of '08 through the summer of '10 - wish we were going to be going back for a visit soon, I miss it! Well, when you come we can head to the markets, sip a little sake, and eat some tasty treats. How's that? We'll keep a spot open for you.